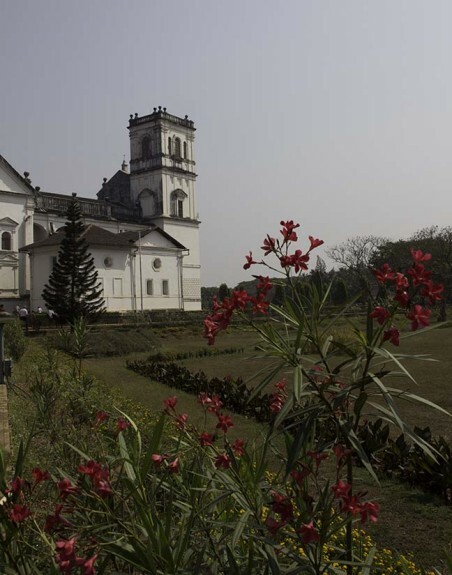 Echoes of the hippy era aside, Goa’s allure today remains its beaches and inexpensive lifestyle. In fact, beaches line some 83 percent of the state’s 60 miles of coastline, most of it washed by a warm Arabian Sea. There are more than a score of named strands, ranging from very commercial—Calangute and neighboring Baga—to tranquil retreats like Mandrem (a small fishing village) in the far north and Agonda (a Ridley turtle sanctuary) in the south. All of them experience seasonal variations, drawing the largest crowds from November through March, typically reaching a peak in December. Those are also the months with the greatest concentration of colorful festivals, including a Goan version of Carnival in February. April and May are very hot, with temperatures in the 90s. By June, monsoon season has arrived and endures into fall. I started my trip at a hotel near Pangim (I was in town for the Goa International Travel Mart). When the conference ended, I decided against an AirBnB-listed beach shack at $15/night and instead moved to a guesthouse near Benaulim Beach, paying $55/night for a opne-bedroom apartment with air-conditioning and intermittent WiFi. I rented a bicycle (about $1 a day) to halve the time it took to get to the beach down the road to the west and to the small village to the east. Yet Goa turned out to be much more than the sum of its beaches–and not at all like much of the rest of India. For 450 years Goa had been a Portuguese colony. That didn’t end until 1961. 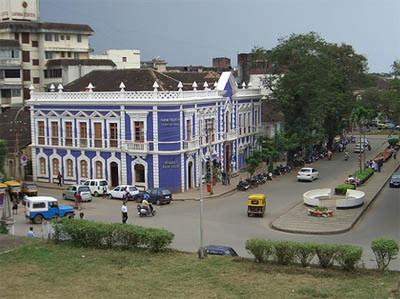 That legacy shows in the architecture of the state capital of Panjim and in a wealth of churches and convents, among them two World Heritage Sites: the Basilica of Bom Jesus, which dates to 1605 and holds the mortal remains of St. Francis Xavier, and the churches and convents of Old Goa, chief among them Se Cathedral (seat of the Archbishop of Goa), the largest church in India and perhaps all of Asia. Touring these sites in 90-degree heat with a crowd that included women in saris and men in turbans was at once fascinating and disorienting. Whatever else, this was not the India I’d later experience in Mumbai–certainly not the India of Slumdog Millionaire or the Best Exotic Marigold Hotel. In fact, Goa is one of India’s richest states: it has the highest GDP per capita—two and one-half times the country as a whole—and a very high literacy rate of 87 percent. Moreover, the mountains to the east are known for their biodiversity and harbor numerous wildlife refuges and bird sanctuaries. Its byways and rural roads, though slow to negotiate, can be exceptionally beautiful, lined with trees and carefully constructed low rock walls, like those you might find in New England. Greenery abounds. 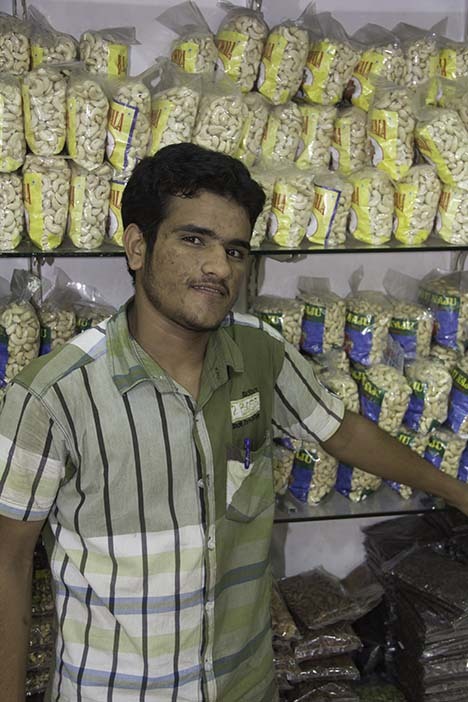 Cashew seller in Pangim. Photo Roger Cox. I wandered happily through the streets and market in Panjim (where I bought bags of the fabulous local cashews and marveled at barrels of rice in a rainbow of colors and the hennaed hands of young shopgirls). I also toured a tropical spice plantation, tasting feni, a potent drink made from cashews, where I stocked up on oils and powders to take home. But as a Westerner and a newby to India, I was far most intrigued by the Hindu temples, which are scattered through the countryside. That led me to the 18th-century Shri Mangueshi, set above an impressive brick-and-tile-lined ceremonial water tank about a dozen miles from Panjim. A set of stairs climb to a courtyard that encloses the blue-white-and-yellow domed temple itself–a cross-cultural mix of Christian and Muslim architectural styles–and a seven-story lamp tower inset with colorful depictions of the Hindu gods. Leaving shoes outside, I entered the temple, where bare-chested priests in white cotton dhotis presided in a room with marble floors, silver chandeliers, and a far wall with embossed images of gods and serpents and a gold and silver shrine to Shiva. Getting around to see these attractions can be time consuming. 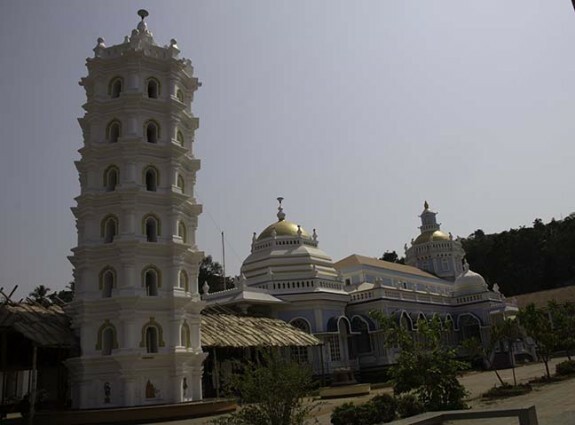 Improving infrastructure to make exploring easier is one of a number of issues that the Department of Tourism, Government of Goa (www.goatourism.gov.in/), is addressing in a 25-year tourism master plan for the state. Essentially, they hope ultimately to redefine Goa’s appeal, one more in keeping with position as one of India’s richest states. Among the proposed changes are greater focus on cultural heritage, festivals, cruise ship piers, river excursions, weddings, and medical tourism. They realize they need to develop more tourist friendly mass transit. They want to encourage the construction of more golf courses, water parks, and oceanariums. They also want to lure more 4- and 5-star hotels (to supplement the two Vivanta by Taj properties, The Leela, the Grand Hyatt, and others), and encourage more restaurants to offer Goan and other native cuisines. From their perspective, the airport needs to be better and so does the convention center to attract more meeting and incentive groups. And those alluring beaches need more lifeguards, better sanitation, changing rooms and lockers, improved parking, and more and better police patrols–including at night. Many of those goals–like improved mass transit and better beach amenities–would unquestionably enhance the traditional Goa experience for everyone who visits. But behind these changes is the professed desire on the part of Tourism Goa to alter the region’s visitor demographic with the idea of luring what they’re calling “the right kind of tourist.” Rather than backpackers and charter flights of hard-drinking Russians, they are blunt about wanting to substitute a clientele with more money to spend–even if that means turning their backs on the very clientele that have sustained them over the decades. Fortunately, 25 years is a long time, long enough for someone to ask whether the world needs a Miami Beach along the Arabian Sea. Meanwhile, the wrong kind of tourist, like me, can still settle into a place near the beach and stroll to the water’s side for a cheap dinner and a beer to watch the sunset. Not quite the same a dropping out, but still a reason to visit Goa. Roger Cox is the founder and editor in chief of Tennis Resorts Online. What great places to visit, I would love to take a trip someday, thank you for sharing!